This weekend was one of those weekends that felt like it would never end. Some of us are nursing colds, so we made no plans and just kind of laid about all weekend. Sounded kind of relaxing to me on Friday night. By Sunday evening it felt like a hostage situation. Nerdguy kept saying “I’ll bet you’re looking forward to 9:30 Monday morning for some quiet eh?” I begged him to keep his trap shut so that he wouldn’t jinx it. But of course he couldn’t help himself. This morning was one of those ‘buses are cancelled but schools are open’ kind of days. It was also one of those ‘Molly is going to try to kill us with slowness and misbehaviour’ kind of days. And finally one of those ‘Maggie’s school isn’t going to open at all, but I can’t find any information stating that, and can’t reach anyone so she and Nerdguy drive all the way there to find an empty building’ kind of days. I thought Maggie would be upset about being brought home right away, but she settled into the whole snow day concept like an old pro. Her first of many demands was a bucket of popcorn. Which she promptly spilled all over the floor. 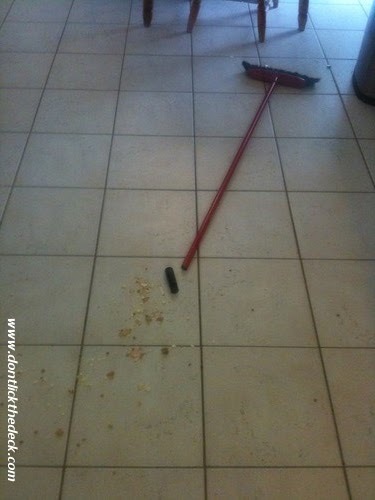 So I tried to sweep it up. And the handle of the broom broke off. Later I tried to vacuum the carpet. The beater bar decided it was going to die as well…in some kind of bizarre suicide pact it had going with the broom. 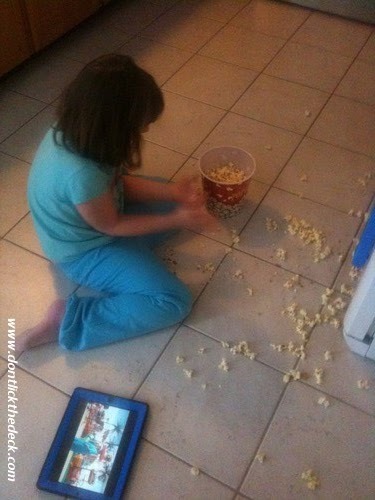 It just mulched up pieces of popcorn and spit them wood-chipper style all over the room. So I got out my bare floor attachment and started vacuuming the kitchen and hallway. Something in my behaviour had indicated to Maggie that I must have challenged her to a duel. 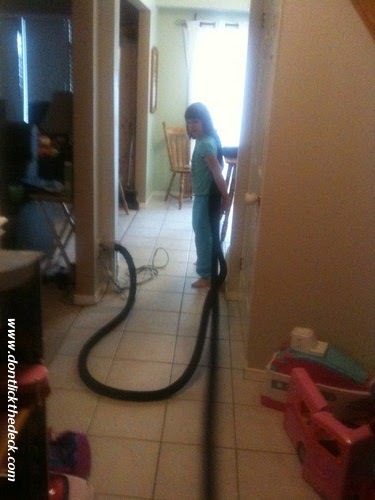 She began pulling on the central vac hose while chanting “Heave Ho” repeatedly. Determined to get the kitchen floor cleaned, I was not going to give in to this game of tug-of-war easily. In a familiar cartoon fashion I alternately advanced forward and was yanked backward by the freakishly strong 7 year old. Just as I was ready to claim victory I was slammed backward into the kitchen table. We agreed that she had won the battle and the war. And that the large quantities of bacon that I consume must not be the right protein. Further injuries I received today included whacking my funny-bone full-force into the wall while trying to get the vacuum out of the laundry room, forgetting the shape of the room of the house in which we have lived for 11 years; burning my hand with hot water, and while flinching, accidentally flicking more of it onto my sock, which promptly melted to my foot; and finally throwing out my back from shoveling the snow. With the way the day was going, I began to fear for my safety. I was either prepping for the ER or my own funeral. I wasn’t wearing a mustache to either one of those places. It was time to wax. 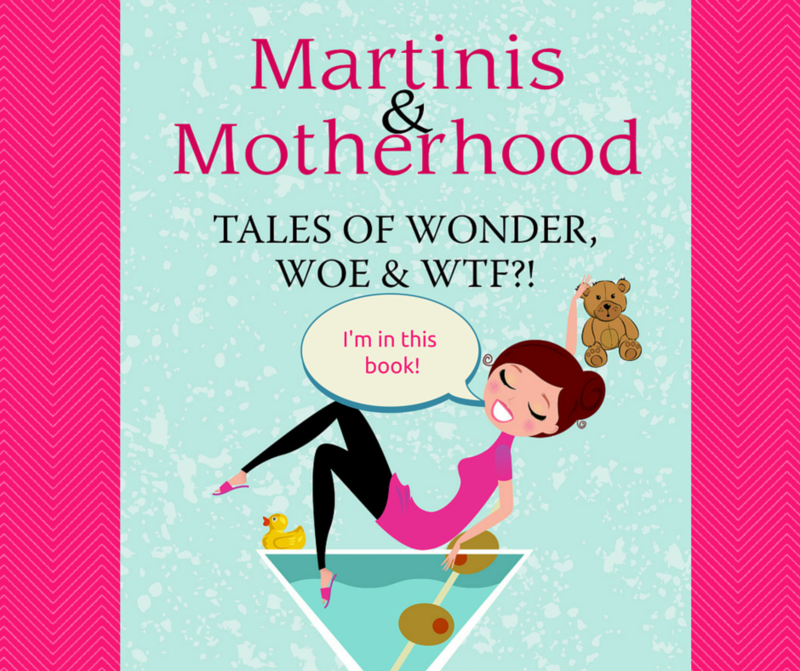 This is the portion of the blog that we must never speak of if I actually see you in person. Actually there are several parts that I don’t want to talk about. Maybe I will just enter the witness relocation program. I already have the mustache. I use this honey-type stuff that you heat up in the microwave, and then basically paper-mache yourself with these little pieces of cloth. After that is the ripping. And the screaming. This all sounds like something that someone would do exactly once. But because I have no sense about me, I have done this hundreds of times in my life, and usually know what I am doing. I got the honey all over my hands, and every time I tried to fix it I just made it worse. I ended up looking like a cross between Winnie the Pooh with his honey pot, and Clarke Griswold when he was covered with sap in Christmas Vacation. I don’t think salon will be recruiting me as an esthetician any time soon. I barely survived this snow day. The good news is that Friday is a PA Day. I’ll be increasing our insurance coverage and assembling the first-aid kit. You keep an eye out for locusts. Oh my gawd, I would run and hide before the PA day on Friday! I’m going to wrap myself in bubble wrap! seriously. I love you. Every. Single. post. I read! You rock my world! I mean, you make my life look like a dream! Love it! Haha thanks Julie! Things are tough here in Ontario! 😉 You’re awesome! Locusts & falling frogs. Job had it better than you, sister! I don’t think my umbrella can stand up to frogs! Every time I read one of these posts and start laughing so hard I cry, I have to go back to the beginning and start again – I’m too afraid of missing a single punny/witty/hilarious line. Oh no…my ADHD is catching…rereading everything is the first sign! Thanks mama! HAHA, at Hostage Situation. Gosh, you bring me joy! OMG. How can this all be in one post? WZXING! It totally was a hostage situation. But without a hot flashpoint team outside doing anything about it! Are you prepared for flooding? Because it seems that the snow day has morphed into a ‘quick, build an ark’ day. No kidding! I went to a meeting at the church last night and suggested that we change the purpose of the meeting to building an ark. They thought I was kidding. Wouldn’t even help me pair up the animals.